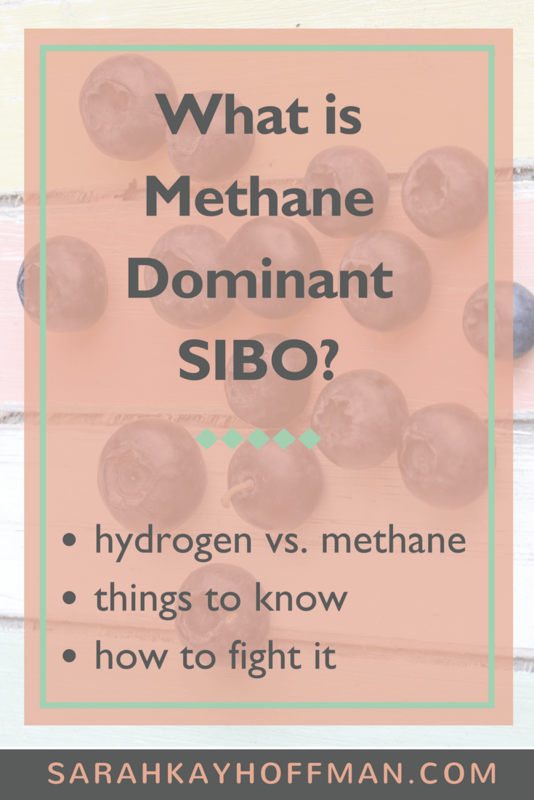 I recently shared with you the Methane dominant SIBO protocol I’m on, but after I published it I realized that it might be helpful to know what is Methane dominant SIBO. 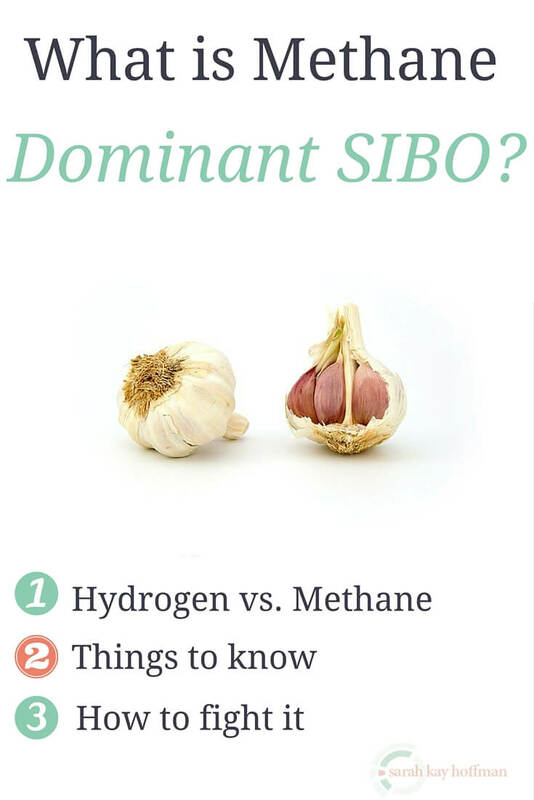 There are two versions of SIBO, Hydrogen dominant, and Methane dominant. The first time I tested, I had Hydrogen and very little Methane (which I still think was inaccurate based on my past, symptoms and characteristics). The second time I tested, it was Methane dominant. This last time I tested, I barely produced any Hydrogen and mostly Methane, with the Methane levels about the same or just slightly higher than the previous time. The focus of this post is not on Hydrogen dominant SIBO, but I want to at least briefly describe it. I like to think of SIBO in two “phases.” The first Hydrogen; the second, Methane. SIBO presents itself when there is too much bacteria in the small intestine. That bacteria causes unabsorbed carbohydrates to ferment, and that process of fermentation creates hydrogen as a byproduct. In other words, if you have too much of this bacteria in the small intestine, you will test positive for Hydrogen dominant SIBO. 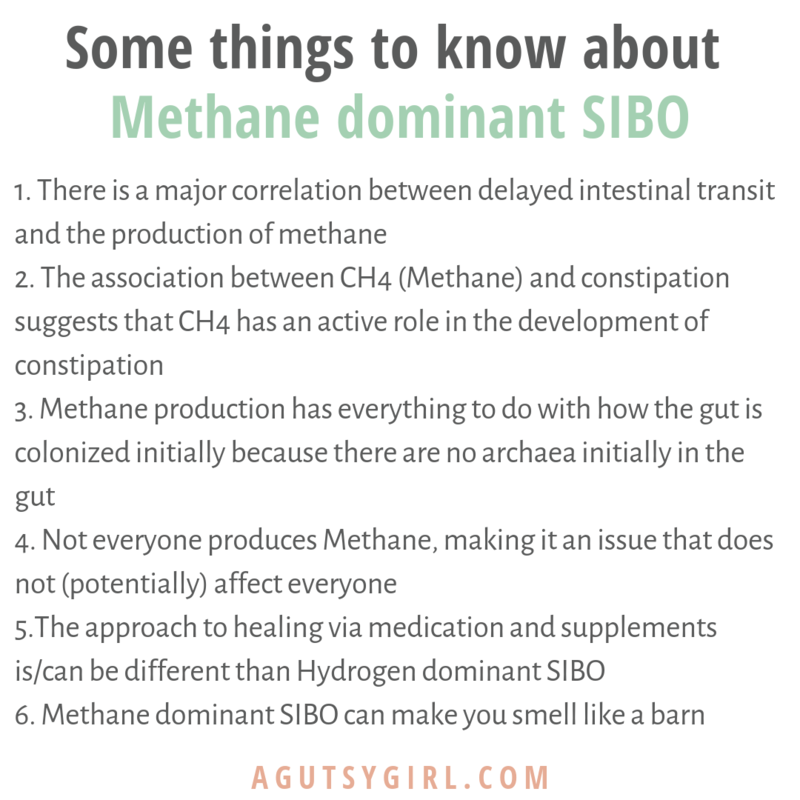 What is Methane Dominant SIBO? Anaerobic fermentation of the undigested polysaccharide fraction of carbohydrates produces hydrogen in the intestine which is the substrate for methane production by intestinal methanogens. To be more specific, when you have an increase in methane after drinking this solution, or if you just have high levels of methane at baseline, that indicates an overgrowth not of bacteria, but of these methane-producing archaea. Unlike bacteria, which primarily produce hydrogen, the archaea are what produce this methane, and they do this actually not by fermenting carbohydrates. So bacteria produce hydrogen and the way they do that is by fermenting fibers. The methane production works differently. The archaea consume the hydrogen that’s produced by the hydrogen-producing bacteria, and then they produce methane as a by-product of that process. Research has indicated that Methane dominant SIBO is much harder to get rid of than Hydrogen dominant SIBO. Click HERE to save these for later. You can read article after article that will tell you the best way to fight Methane dominant SIBO, but here’s a little secret I’ve learned during these past couple years battling SIBO (wait, who am I kidding, I think I’ve had SIBO for at least 10 years now, but only diagnosed a couple years ago): there is no best way, and you might need to try many different approaches in an ultimate battle with SIBO. After last week, though, I can now be more confident than ever that diet will play a huge role in overcoming Methane dominant SIBO. I began starving the gut bacteria on Monday, and by Wednesday was feeling so much better. I had completely suppressed all symptoms, and then I found out that my antibiotic is shipping from Australia by the end of the week. I got so excited that I ate all the FODMAPS (plus some rice and beans) on Sunday night. I woke up on Monday morning with zero after effects. Zero. From now until my antibiotics come, I’ll be adding in FODMAPS here and there, daily (to promote some of that bacteria to resurface), but for the most part, I’m still keeping to SCD. I am excited to see what happens and to continue fighting this battle. Want more? Check out 8 SIBO Signs and Symptoms. Hi, Janet! I got the Rifaximin in Australia. But if you want to know the truth? I’m almost at the 2-week mark, and I don’t think it’s working this time. I am 100% confident that the only thing that will work for sure to suppress symptoms is the low-fodmap diet and then healing it will take work on my underlying issues. Good luck! Sarah, I have SIBO. Diet and herbal supplements give me relief. Metagenics Candi Bactin AR And BR are amazing. Lots of herbals and no sugar, gluten or starches. Biotics also has supplements that work great. FC Cidal and Dysbiocide. I was diagnosed with SIBO Methane via a breath test in October 2016. I went on a moderate carb diet, grain-free diet (the PHD, by Jaminet) and took a botanical protocol (Atrantil). Two months later I was symptom free and have remained so. I never gave up FODMAPS. HI Sadie, Can you give me some more info about what you did? I do not want to take antibiotics and I want to beat this and doing the FODMAP diet seems incredibly confusing, conflicting information and I need another solution, help please! What was the moderate carb diet? I am so grateful for your post. It pointed me in the direction of Atantril and diet and it has been working!! Even though my mom passing away this last week, my gut was so so much better. I have been doing low fodmap for a while and then I cut out most all veggies except lettuce. I use some meal replacement bars and crunchy things that are protein and carb balanced and that has been great!! How do I learn if I have SIBO Methane? I took a breath test and was considered borderline. Because I had a previous poop test that suggested SIBO, the doctor treated me with xifaxan. I do have MTHR issue. Probably methane? Thanks for your thoughts. I’m pretty unhappy right now and doctors don’t seem to have a clue. I know this is a year later, but I was wondering if you got any answers. I seem to be in the same boat you are, mthfr and all. I have had tons of tests. 1.) My DigestGold – usually is a miracle-worker but hasn’t been working at all for the last few months. Did you notice this happening with your SIBO as well? 2.) Probiotics- I take VSL3# and they’ve always been beneficial in the past. Should I stop them while in treatment or keep taking them? Are these antibiotics killing the good bacteria as well? 3.) Atrantil – I’ve never taken this before but I am interested in starting. Do you recommend it as a maintenance therapy after completing antibiotics? Or is that “overkill”? 4.) I also have Crohn’s – have you read any research regarding IBD patients being affected by SIBO higher than general population? Or immunotherapy medications affecting SIBO bacteria levels? 1. No, the DigestGold works great for me. 4. I have Colitis as well, too – so I’m a double patient like you 🙂 That said, I’m not sure on your question because I don’t take any medications for the Colitis (well, sort of, LDN). Finally, I am **NOT** any sort of medical expert, so please make sure to run all these questions by your doctor. Have a wonderful day, and thanks for reading! Thank you for sharing! I can’t get a dr to get me on antibiotics for a long enough period to kill this! How did you get your Xifaxan ? Did you have to have a Dr perscribe? I’m so desperate to get this right. I feel like I’ve studied enough and have enough intuition to treat myself the best, but obviously that’s hard to do!! I can’t even begin to thank you enough for your wealth of knowledge! I so resonate with you..
I’m assuming you had a Dr send a prescription out of state for cost reasons? I took a medication known for causing weight gain, I stopped and realized it might’ve changed my gut. I learned about Methanogens recently and soona after found a study on the medication I took as a drug that’s associated with methanogen gut population problems. I’d like to get rid of most of them and didn’t want to believe that even milk is associated with more methanogens. I haven’t gotten my microbe population analyzed yet, but can I get another microbe in there to outcompete them in my gut and/or ask for Rifaximin and Neomycin together. I remember before the medication that losing and maintaining was easy and my gut seemed in balance.